In the installation page of SQL Server 2019, we get below options. It is very important for the database developers and the database administrators to be familiar with the SQL Server on all environments. In most organization, SQL DBA might not be having the test Linux environment. Therefore, it becomes difficult to explore this version on the cross-platform operating system. In this article, we will install SQL Server 2019 CTP 2.1 on the Ubuntu Linux. Before installing SQL Server, we will prepare the test VM environment. In this part of the article, we set up a virtual machine and load Ubuntu operating system in it. You can follow this article to install SQL Server 2019 CTP 2.1 on Ubuntu without having knowledge of the OS other than Windows. Select the VDI (VirtualBox disk image) in the next step as shown here. Specify the hard disk name. We will keep it same as the name of our virtual machine. Since we are using dynamically allocated hard disk size, we can simply move to the next step. Now, click on ‘Create’ and we can see the new virtual machine on the left-hand side. The current state of the virtual machine is ‘Powered off’. Before we move further, we need to download the Ubuntu operating system software. We will install the latest version of Ubuntu 18.10 for desktop PC and laptops. Go to the link ‘Download Ubuntu Desktop’ and download ‘Ubuntu 18.10’. Now, let us start the virtual machine which we created earlier. Right click on virtual machine ‘SQLVM1’ and click on ‘Start -> Normal Start ‘. We have not specified the image of the Ubuntu in the virtual machine yet. When we start the virtual machine, it asks for the start-up disk. In the start-up disk, specify the path of the downloaded ISO file of Ubuntu 18.10 and click on ‘Start’. Now, the Virtual machine starts to load and configure the Ubuntu operating system from the ISO file. Normal installation: Normally installation installs Ubuntu OS with the web browser, office software, and the media players etc. In the next step, we can choose from the different options provided. By default, it gives the option ‘Erase disk and install Ubuntu’. We have created a new hard disk, so we do not have an issue with the erase disk and then install Ubuntu. Click on ‘Install now’ to begin the installation. Click on ‘Continue’ to erase the disk and install. Provide the location and click ‘Continue’. Enter the personal details like full name, username and the password. Now it starts copying the files and show progress as installation goes on. You can track the progress of the Ubuntu installation. Once the installation is complete, we need to reboot the system as per the message is shown. During the reboot, it gives a message to remove the installation media and press ‘Enter’. Now the Ubuntu software loads into the virtual machine and we can enter the password for the user created during installation. We can connect online accounts to access the documents, images etc. We can skip this option as it is not mandatory. We can choose to send diagnostics information to Ubuntu developers to improve the product. We can disable this option by click on ‘No, don’t send system info’. In the below command, we can see the Ubuntu version as Ubuntu 18.10. 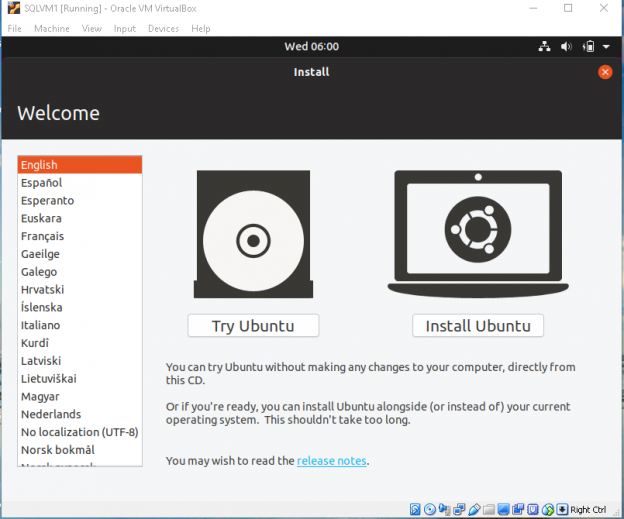 In this article, we explored to prepare Oracle VM VirtualBox and install Ubuntu 18.10 on it. In the further articles, we will install SQL Server 2019 on it and explore its important features.